The Holy Place (Hebrew: קֹדֶשׁ, Qṓḏeš) is a term in the Hebrew Bible which refers to the eastern area of the Tabernacle and later the Temple in Jerusalem. The first area of the tabernacle measured ten cubits upon entering and was called the Ulam. No articles were placed in this area. 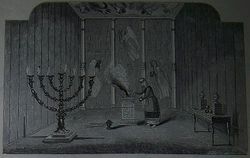 In the next ten cubits there was a Menorah, the table of showbread, a bronze laver and a bronze altar. The lampstand stood on the south side of the Holy Place, and the table of showbread to the north. The bronze altar and bronze laver rested outside the tent. This page was last modified on 21 November 2013, at 18:33.